There already are some solutions in the Google play store but I could not find a decent remote that fit to my recent project. Most of them only have 4 buttons and a control delay of a few seconds. So I decided to create my own app. The only real programming experience I had so far was in C and Arduino. Normally Java is required for android apps but learning it was not in my time frame. I remembered that last year I used Processing to write a small applet for an assignment. Processing is a programming language initiated in 2001 at the MIT. It has its own IDE, just like Arduino which is a descendant of Processing. Their user interface still look nearly identical. But while Arduino is based on C++ Processing sketches are translated into pure Java. You can easily create software for Windows, Linux, Mac and even Android using a syntax very similar to Arduino. 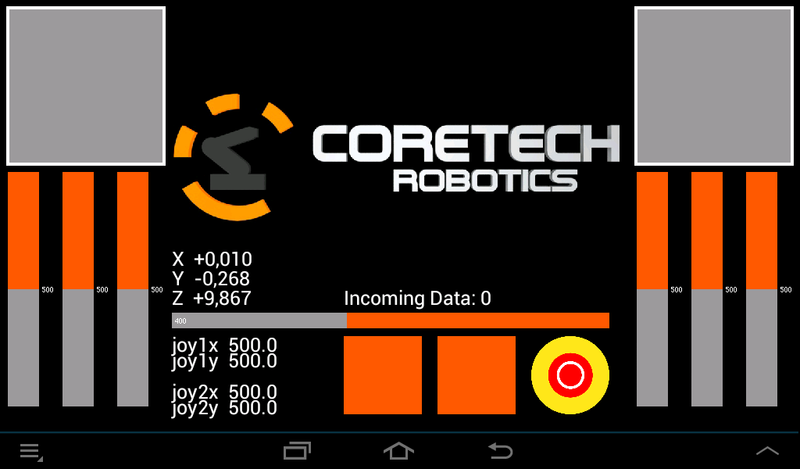 I put those two together and added the UI which uses the ControlP5 library for some parts. Making it really work took a lot of time, especially the communication part. The app was meant for my 7” tablet, so the UI is only displayed correctly on a device with the exact same screen resolution. Last weekend I made some changes to the code to make it universally usable. You should be able to install and run the app without problems if you have a Bluetooth phone or tablet. A screen resolution of around 1024*700 is recommended, I could not get rid of some resizing problems yet. Disclaimer: Use the provided software at your own risk. 4. Now the Icon should appear in the app menu. 6. If you start the app it will prompt you to choose a connection. If there is a LED on the module it should light up after the connection is established. Every slider has a range of 0 to 999. To distinguish them there is a letter in front of every transmitted value (e.g. a034 or c789). 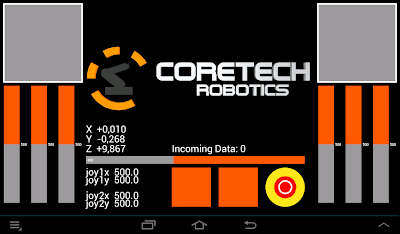 The data for the two Multitouch joysticks is transmitted all the time. Only if a slider value changes it will be transmitted too. The buttons work in the same way, while 999 means true and 000 means false. The emergency off only transmits 999 to make sure that a double press doesn’t switch the system back on. The whole code is not optimized and this is for sure not the most elegant way. I stopped at the point where it was functional, and the control delay is acceptable. It should even be possible to control a Quadrocopter. The entire app is surprisingly fast, it loads in an instant and takes not much more than half a MB of memory. This is exactly what I have been looking for! I was just about ready to give up and make my own! Thank you for making this. I have two very minor suggestions for the app though. 1. The emergency stop button does not seem to visually change on my screen when pressed, this would be good to have. 2. Put the values for the sliders at the top of the slider so that my finger doesn't cover it up when I am moving the slider, you could likely make the text larger by doing this too! Again, thank you for this, it's much better than anything I could find on the Play Store. Thanks for your suggestions! Text resizing is still a problem. I will try to fix that and the button image for the next version. Hi, the links wont work can you provide them again? Great project. Hi Mathew, links should be working again. Crafsol Technology is the worlds largest provider of Robots and Device Solutions that interconnect robots revolutionary in accelerating systems, low cost and high efficiency program to connect Robots and Device solutions.